I got 19 spools done this past week. I love the bright lime green ones the best. I still have a bowl full to sew. I still did more sorting and cutting down the scraps. 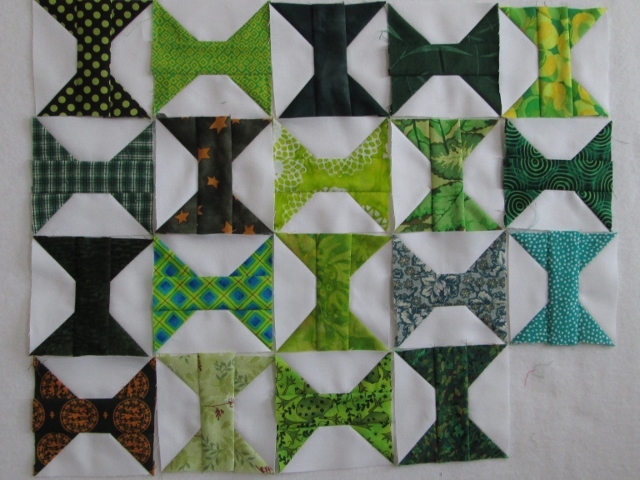 I need 2" squares, 2 1/2" squares and 3" squares for some of the blocks I am planning. I will also use some strings. Then the smallest bits can be used in crumb blocks. 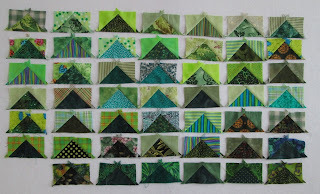 I have added today's post to So Scrappy and the Rainbow Scrap Challenge 2013. I got 48 flying geese done today. I am still not sure how or where this geese will be used but they are cute. I had to show you these trees - evergreens. They are from an old UFO quilt top. I made them by using a pleater board. They are 3D. You have a lot going on! I really like your trees - the 3D effect is cool. My cutting area looks a lot like yours! I like all the green flying geese - is there a plan for them yet? Interesting idea with the evergreens - a little texture is always fun! 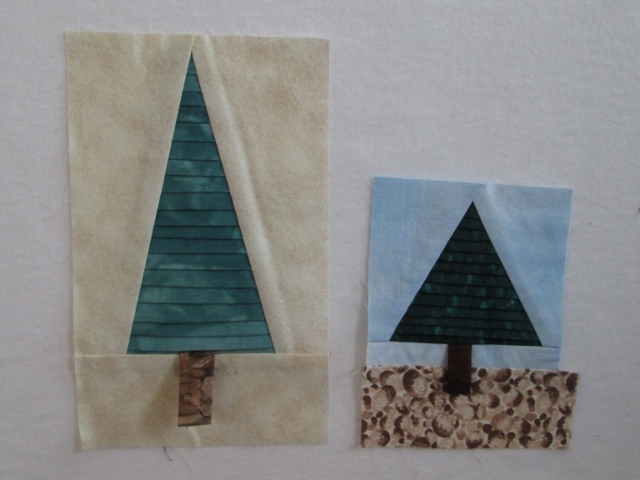 I've never used a pleater board, but the trees are super cute. Looks like you will be busy with green this month. I would feel good about doing half of what is on your list. LOVE your green spools, geese and trees. And your plans for other green projects. You may be having a little more fun playing with green than I am, but not much. Personally, I want to have all kinds and lots of completed rainbow blocks to play with in December and January. Wow! It's greenarama at your place! 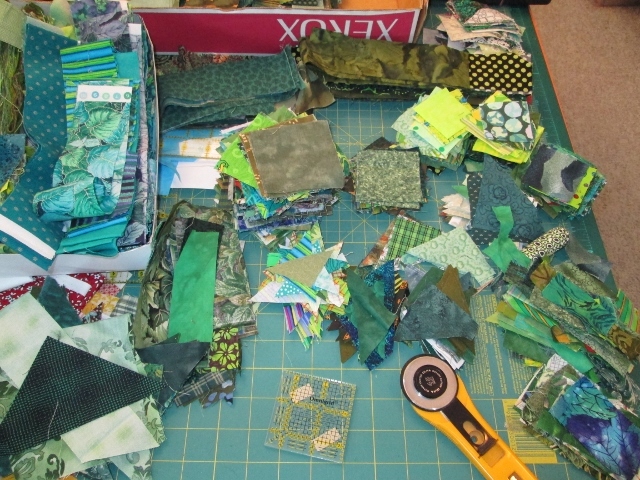 Love the photo of the green cutting board full of yummy scraps! Love your spools and geese, can't wait to see what plan you come up with for them. 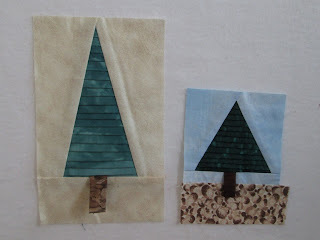 Your little trees are great..I've never used a pleater board either but a friend has one and I might just have to try it out now that I've seen your little trees. Just found the RSC13 Challenge on another blog, and was trying to figure out if it's too late to start and if I even have enough scraps. When I saw your flying green flying geese posted, I clicked on you. Love all your greeen ideas!! And if I do this, think it's gonna be the geese, though your spools are tempting! Love the pleated trees!! Looks like you are having a blast! Stay warm! !